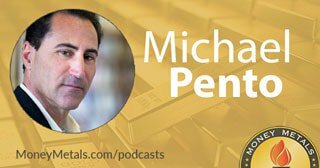 Coming up Michael Pento of Pento Portfolio Strategies joins me for a must-hear conversation on why he believes central bankers must perpetually keep interest rates near zero -- and the massive inflationary bubble economy that will likely result. Also, find out how Michael is approaching gold and gold related investments for his clients right now. Don’t miss a tremendous interview with Michael Pento, coming up after this week’s market update. Precious metals markets are trading mixed this week as gold struggles to regain the $1,300 level. Gold prices pushed higher mid week but got pulled back down on Thursday. As of this Friday recording, the yellow metal comes in just above that key physiological level at $1,303 an ounce, up a very slight 0.3% for the week. Silver looks lower by just a couple cents or 0.3% this week to bring spot prices to $15.36 an ounce. The platinum market shows a weekly gain of 1.6% to trade at $834. And finally, palladium is leading the precious metals pack once again – advancing 2.4% this week to trade at $1,559 per ounce. Palladium finds itself just few dollars shy of another new record high. It has been recording all-time highs with regularity this year. Over the past three years, palladium prices have tripled in value. One of the real world consequences is a rise in catalytic converter thefts from parked vehicles. A car’s catalytic converter typically contains platinum or palladium in relatively small amounts. The metals help remove harmful pollutants from emissions. In recent years, automakers have favored palladium for use in the converters of most gasoline-powered vehicles. That decision seemed smart when palladium prices were cheap. Now that they are approaching sky high territory, automakers are fretting. And many car owners across the country are facing costly replacement bills for stolen catalytic converters. Thieves eager to cash in on high palladium prices are targeting everything from students’ cars to church vans. News Anchor 1: Good evening, everyone. The Appaloosa's Police Department is dealing with a rather unique crime, catalytic converter thefts. Police Officer: There's some metals, precious metals, inside of the converters that they're taking them for. They're selling them. News Reporter 1: Part of a vehicle's exhaust assembly, catalytic converters help filter out pollution. Mechanic: All that has to filter through here. News Reporter 1: Mechanic, Robert Zaharitas says they're a hot commodity with crooks because the interior contains small amounts of precious metals. News Reporter 2: Crooks are climbing under vehicles and taking the catalytic converters. They even hit a student's car while it was parked outside of school. And replacing this car part is not cheap. News Reporter 3: The van used at Living Faith Baptist Church doesn't normally sound like this. Church Pastor: We looked up underneath, and you can see where it had been sawed off on both sides of it. News Reporter 3: Bill Chambers says they discovered the catalytic converter was missing last night as a group was loading up the van with donations for a food bank. Church Pastor: Couldn't believe somebody would do something like that, especially to a church. County Sheriff: We've had a few churches that have been hit with their vans, and so this is a trend that we've not seen in several years. Some in law enforcement are calling on car manufacturers to install anti-theft cages around catalytic converters to deter thieves. In the meantime, motorists are being advised to install vehicle alarms and avoid parking their vehicles in unsecure, wide open areas where thieves like to operate. Unfortunately, bull markets in metals bring out the worst in some elements of society. When copper prices were at record highs, criminals set their sights on homes, construction sites, and electrical infrastructure. When other base metals were flying high a few years ago, some cities even suffered thefts on manhole covers. When gold prices were setting records day after day from 2010 to 2011, scammers came out of the woodwork. Some ran slick television ads on cable TV news programs touting the value of gold but then sold customers overpriced coins falsely touted as “rare.” Some of these shady coin dealers got hit with lawsuits over their fraudulent and deceptive business practices. Unfortunately, bait and switch “rare coin” peddlers haven’t really gone away. They will undoubtedly be back in bigger numbers to prey upon the uninformed when the gold market is grabbing headlines and trading at record highs. Seasoned precious metals investors aren’t moved by sales pitches for obscure coins with huge markups. They don’t wait to buy until mainstream media headlines tell them the gold market is hot. Instead, they accumulate common, low-premium bullion products over time – ideally when prices are low and the market is quiet – aiming to get the most ounces for their dollars. Money Metals Exchange has a simple way for you to purchase bullion each month - automatically and at a discount. It’s our Monthly Savings Plan. Every month, Money Metals will deliver beautiful gold and silver bullion products directly to you. Or you can store your metals holdings securely at Money Metals Depository. We offer high security storage in our state-of-the-art facility. Just choose the monthly dollar amount you wish to invest, which can be as little as $100. Or choose the number of ounces you want to buy. We offer silver bars, silver rounds, Silver Eagles as well as a variety of sizes of gold all the way down to a gram. You can accumulate as little as 2 grams of gold per month if you wish. The advantages of putting your bullion accumulation on auto pilot include not having to guess when to buy and never second guessing your timing. It’s a stress free and prudent way of accumulating a position over time. You dollar-cost average into the market regardless of where prices are trending. Participants in our monthly plan also gain access to even lower premiums than those available to the general public! You can enroll online or with one of our specialists by calling 1-800-800-1865. Mike Gleason: It is my privilege now to welcome back Michael Pento, president and founder of Pento Portfolio Strategies. Michael is well known money manager and a terrific market commentator and author of the book The Coming Bond Market Collapse: How to Survive the Demise of the U.S. Debt Market. He's been a regular guest right here on the Money Metals Podcast and we always love getting his wonderful insights. Michael, thanks for the time again today and welcome back. Michael Pento: Hey, looking forward to be back on with you again Mike. Mike Gleason: To begin as a primer for our discussion today, I wanted to turn back the clock a bit and revisit some of what we were talking about during our last conversation. Now, when we had you on back at the very end of November, we were in the midst of what was a pretty bearish time and the stock market and that continued up until Christmas. But then Treasury Secretary Steven Mnuchin came out and made some interesting comments and also met with the heads of many of the nation's biggest banks. And sure enough, in the weeks following the equity markets went on a tear. So, did you watch what transpired there Michael, and come away with some of the same suspicions, that we did that being that the powers that be worked in concert to keep the wheels on the markets and help it rebound from a very rough ending to 2018 or was the market simply due for a bounce back after a late year selloff? Touch on that first if you would before we get into other topics. Michael Pento: Sure, my pleasure, I believe the market bounced, and by the way, I was short from a September, late September all the way through Christmas Eve. So, I covered my shorts in the portfolio, in the inflation-deflation portfolio. I then went long a little bit too early, obviously in January. So, I'm on the wrong side of that particular part of the trade although that's offset by longs in other stuff like gold and in treasuries and utilities. But the reason why the market in general bounced is because how many times can you hear that the trade deal between Xi Jinping and Trump is going to be fantastic and it's going to happen imminently. So, I firmly believe, Mike, that nobody wants to be under the market or short the market especially in front of the imminent announcement of a trade deal. That's number one. Number two is of course the move from an extremely hawkish, Jerome Powell, one that was going to raise rates to three and a half percent on the Fed funds rate and was promising that the Quantitative Tightening program was going to remain on autopilot just like the predecessor Janet Yellen assured that it would be like watching paint dry. Of course, none of those things happened and it totally seized up the high yield and junk bond market stock market drops 25 to 30% depending on the index you look at. And of course that through the Fed into fits. So, they came out and moved from being hawkish to being more dovish. Although I hasten to add, I want to add two things. Why I still by the way, still have a short buffer in the portfolio, is number one is, Mike, the trade deal or the trade tensions have nothing to do, virtually nothing to do with the plunge in global growth in the global economy. Virtually nothing. First of all, I can prove that by claiming the facts. The facts are that Chinese exports to the United States increased by 11% in 2018. And exports from the U.S. to China, we're up by a little bit less than 1%. So, trade actually increased, and it led to huge buildup in inventories, which is a plus the GDP. Because people were front row and front running the tariffs that we're going to go up supposedly in January and then they were supposed to go up again in March of course, that has never happened. So, the trade conflagration has nothing to do with this collapse in global growth, which we'll get into later. That is not what hurt the global economy. Number two is the Federal Reserve did move incrementally more dovish. However, I hasten to add this, this event is not lowering interest rates at this juncture. That's number one. Number two, the Fed is still in the process of its Quantitative Tightening programs. Still unwinding, burning about $40 billion worth of its assets per month. Now that's going to change, that's going to end probably in October, they'll let us know in the March meeting. The FOMC will let us know when that process is going to end. But again, the Fed reserve is not dovish, a dovish Federal Reserve is one that has hundreds of basis points on the Fed funds rate that they are in the process of reducing or one that is in the process of buying assets and increasing its balance sheet that is a dovish Fed we do not have that at all. As a matter of fact, if you look overseas or you look abroad, other central banks like Japan, the BOJ and the ECB, the European Central Bank have no room to reduce interest rates. So, if I'm correct and economic cycle has turned and we were heading into a global recession, then I would be very hesitant to go out and buy shares of the S&P 500 at 18 times trailing 12-month earnings, which by the way, these earnings are falling. Mike Gleason: Michael, you wrote something recently about the extraordinary levels of consumer debt in the U.S. and mounting evidence of a crisis building. You noted there are now more than 7 million car loans, delinquent more than 90 days. And an overall debt levels are higher than just prior to the 2008 financial crisis. Yes, the real estate mortgage market might be healthier now, but the fundamental problem of a nation choking on unpayable levels of debt has certainly not been solved. Share some of your observations about the current state of this slow motion crisis. And what are some of the signs to look for with regards to the wheels finally coming off and this debt cycle shifting away from expansion into contraction? Michael Pento: Well, okay. We haven't solved any of the problems that were extent in 2008. What we did was take interest rates down to 0% from five and a quarter percent. In fact, the whole world reduced interest rates are virtually 0%. Which engendered a huge increase in the amount of debt outstanding. The S&P ratings agency just said that debt has increased by 50% globally. You’ve increased the debt level by 50%! Other metrics are showing that we have $250 trillion of global debt right now and that's 330% of global GDP, a you record high? If you look what is going on in China, for instance, Chinese household debt. This is not me, this is an independent agency called the S&P 500 ratings agency. This is not what Michael Pento has come up with. Household debt in China is up 716% since 2008. Non-financial corporate debt up 400% in 10 years. Total government debt up 416% in China in the last 10 years. Now that's just China, but you look at the record, high amount of corporate debt here in the United States to $9 trillion from $6 trillion. If you look at a record amount of household that you'll get a doubling and then 2 trillion more of a government debt here in the United States. What we've done is we've enabled, we've juggled using smoke and mirrors, all of this phony economy by taking debt up to record high levels and making it sustainable by keeping interest rates at 0%, which has also engendered asset bubbles that are out of this world. In other words the home price to income ratio in the United States right now is 4.5 to one. The record high was 5.3, but the average is three to three and a half. So, you have a whole group of Gen Xers or Millennials that cannot afford their house because they're buried in student loans and their incomes are woefully insufficient to purchase home prices that are way above their salaries. That's just in real estate. Look at the stock market back to 140% of GDP, when the average of that metric is 60% of GDP. We've all of these bubbles, they're supported by records, amount of debt that are in turn supported by interest rates and borrowing costs that are 0%. So this is a very unhealthy, very dangerous cocktail that could blow up at any moment. Mike Gleason: Yeah, it seems like the question is just a matter of when, not if, when it comes to that blow up. Now we aren't political commentators and I know your focus is on economics and markets though these days it is hard to keep the markets and politics separated. So, we thought it would be fun to get your take on where you think the proverbial ship is headed. The federal government is back to running trillion dollar deficits and there's almost no one left in Washington who seems to care much about it. In fact, there are some avowed socialists who think government should be doing a whole lot more and they are getting ready to challenge Donald Trump in 2020. We don't know how good the chances are of a socialist getting elected, but there is little doubt the ideology is increasing in popularity. Would you care to comment on what you think our listeners should expect out of Washington over the next few years? Michael Pento: Well this is even if you're a big believer in Republicans, I'm a libertarian, so I just come out and say, I voted for Donald Trump and I'm a libertarian by nature. Even the Republicans or more and more like enemies of the free market. So, what I'm trying to say to you is that across the globe there is an intractable move towards communism, socialism and the abolition, and abrogation of free markets. So, the control of governments, no matter who you vote for, of course, if you vote for someone like a Bernie Sanders is going to be worse than if you voted for Donald Trump. But the point of the matter is that nobody believes in markets any longer. So we don't have a president who wants a fair and honest interest rate. We don't have a central banker that wants an honest interest rate. We don't have a politician who wants an honest interest rate. We don't want to protect savers, we don't want to protect retirees. What we have become in this country and around the world are purveyors of asset bubbles. That is the only job now of central bankers and politicians is to ensure, since they’ve usurped the power of the free market and taking it upon themselves. They have one mandate, it is only this to make sure asset prices, and that's is the value of bonds, the value of equities, the value of real estate never fall. That is their only mandate. That's so sad to say but no matter who you vote for, you can be assured that your freedoms will be usurped and you can be assured that free markets will become more and more extinguished and extinct. Mike Gleason: What are the dangers, the long-term dangers, I know we talk about this a lot, but just to expand on it, if you would. In terms of not letting markets ever correct. I mean this sort of gets back to the whole idea of the difference between say Austrian economics and Keynesian Economics. Markets do need to correct. Do they not? Michael Pento: Mike, the markets have become the economy. So this was the determination made by Jerome Powell and the time span between October 3rd and December 24th. So, he then realized that his reverse QE program or Quantitative Tightening, taking money out of the system when you've already sent asset bubbles astronomically above the underlying economy, was an untenable position. And he realized this because the high yield market, see he stopped. There wasn't any issuance, not one high yield bond was issued in the fourth quarter in December. So, they understood that the level of junk bonds, the price level of junk bonds and the level of the stock market and the condition of solvency or perceived solvency of pension plans, all hinged upon the level of asset prices, stocks and bonds and real estate. And once those prices corrected, and by the way, they were only down 25%, 20 to 30% depending on the (index), 30% on the Russell and a little less on the S&P 500. But it was determined that this is very quickly, it was determined that this cannot be allowed to occur. But here's the problem that I see, you saw nothing. So you asked me, well then Michael, why don't a central banks just stay at zero and just keep printing money? Well eventually Mike, they're going to get the inflation that they so desire. And when that happens, every fixed income instrument that is not being actively purchased by the central bank will implode and yields will skyrocket. And inflation, by the way, is going to wipe out any vestige left in the middle class. But here's what Quantitative Easing does accomplish. It does, if it's protracted and immense in nature, it can produce asset bubbles that we know. But we also are aware that Quantitative Easing, money printing, just think of monetizing debt. It's something that you hear about this modern monetary theory. It's all a recycling of the same theory and the same thing is tried had been tried over and over again where the government just prints up just spends money and the central bank buys it, prints it. But it does not do anything for the underlying economy. That's why you see total market capital GDP far, astronomically far above the underlying economy. So, let's look at some of the data that we see around the world today. So, U.S. retail sales plunge a couple of months ago, not the nonfarm payroll report for February showed a net number of jobs of 20,000, housing starts are down double digits, existing home sales went to a three and a half year low. Let's look overseas where they just got out of QE in December. Europe's growth is practically zero. Italy is a 0% GDP, Germany is at 0% GDP, Japan as a 0% GDP growth. The United States, if you look at the Atlanta Fed, our Q1 GDP growth is projected to be 0.4% from 4.2% in Q2 (of last year). And when you think about all this, the earnings per share on the S&P 500, which was once growing at 28% at the height of all his global QE when it was $180 billion every freaking month would now it's zero. The earnings per share has gone from 28% growth to negative three and a half percent according to Factset, for Q1. So, this is what we've been gendered in, this is what we've created in the world. This is an artificial world, totally dependent upon perpetual interest rates at 0% and never-ending Quantitative Easing or debt monetization. That's where we're at unfortunately. Markets no longer exists. There is no more free mortgage in the fixed income spectrum and in most other areas of the world there is no free market for equities. Mike Gleason: Yeah, very well put. Couldn't agree more wells. As we begin to close, we definitely want to get your take on the gold and silver market specifically here. The metal's got off to a great start this year. We saw a pullback at the end of February. Now we're seeing a bit of a rally again. The metals are going to need a catalyst in order to get something serious going to the upside. At this moment we can see some potential drivers, some volatility and selling coming back in the equities markets could push metals higher, but we aren't a sure we're going to see that happen in the very near future. What do you make of the current landscape for metals and what are you expecting in the weeks ahead? Michael Pento: So, here's where what's going on and we are at a record high position for gold in the inflation-deflation and economic cycle model that I run here at Pento Port. So, why is that, okay? Why is that the case? So we were a 5% goal when it was crashing in 2016 and 17 but we are now at 22% gold and gold related investments. So, why is that the case? Because nominal interest rates, there's been a proclamation from central bankers that nominal interest rates can never go above zero. You look at the negative rates now in Japan, the German boom has a yield going out 10 years now of 0.7%. So, interest rates can never be allowed to rise. If you look at our 10-year note is now, at least in the terms of yields, is in a bear market. So, a bull market and bond prices in a bear market in that yield. And when you come to the realization that nominal rates can never really get much above zero, that's a rocket fuel for gold. Because gold loves are interest rates that are close to zero and falling because it doesn't produce any income, it “just” preserves your purchasing power. I say just in quotations, “just” is pretty important. Now because its central banks are also going to have to resort to a return to Quantitative Easing. I believe that the ECB is moving in that direction. They also extended the TLTLRO, which is a Targeted Long-Term Refinancing Operation. Basically just to spell it out for your audience, it's basically when the central bank makes loans to commercial banks and commercial banks don't have to pay back the central bank, if they make that loan to the private sector. They don't have to pay back all of that debt. So, it's a negative interest loan to commercial banks. They're more than incentivized to throw money into the real economy. So, you get – and this was the same thing that the Quantitative Easing does – it's an increase it leads to an increase in the money supply, which tends to erode the faith and fiat currencies, which of course leads to inflation. So that means that real interest rates are going to be very much negative. They are negative and they're going to be coming more and more negative. And finally, I think that eventually as this condition of stagflation, at first, is going to pervade across the entire globe and it's going to wax worse and worse, with greater and greater intensity. And then finally, I believe the IMF is going to have to come in and reset all of all the debt and all of the currencies together concurrently. I think that's going to destroy all the faith and fiat currencies that includes the U.S. dollar. So, the U.S. dollar will seed its world's reserve currency status because of that fact. And that means that gold is going to benefit from three things… three things that are rocket fuel gold is going benefit from, 0% nominal rates and below, real interest rates that are negative and heading lower and the end of the U.S. dollar as a strong and independent reserve currency. That's why I own gold now more than ever. And I intend on only increasing that allocation as my predictions span out. Mike Gleason: Yeah, certainly would be a massive flight to safety into the yellow metal if that does transpire. Very interesting comments as always, we'll leave it there. We thank you again for your time and your wonderful commentary and look forward to catching up with you again down the road as this begins to unfold. Now before we let you go, please tell folks about Pento Portfolio Strategies and then also how they can follow you more closely and then also how they could potentially reach you if they'd like to do that. Michael Pento: We have an office number here, (732)7729-0500. My email address is mpento@pentoport.com. The website is PentoPort.com. You can go to the website and get a two free trial subscription to the podcast. If you want to become a subscriber, it's $49.99 per year. You'll get my general thoughts on a weekly basis if you want to become a client of Pento Port there is $100,000 minimum, but then you'll get me to manage your money and I'll tell you one thing's for sure is that if you look at over the next few years, one thing is for sure is that the control over the market is going to go in the hands, more and more, to the central planners. And they are going to need it to default upon all of this debt this $250 trillion of debt, which is up astronomically as a percentage of GDP and in nominal terms, since the great recession occurred. They are going to need to default on this debt either through, or actually both, in different times, either through inflation or deflation. So, there's going to be an explicit restructuring which is very deflationary, but before that there's going to be a massive bout of stagflation. In fact, I think that's already starting across the globe. So, what you're going to see in the short term is a recession and deflation followed by years of stagflation. And then finally that great reset, which is going to be a deflationary wipe out of the global economy. And that means that you need an active strategy to navigate those treacherous waters. And that's exactly what I do, what I created with my 20 point model known as the inflation-deflation and economic cycle model and investment strategy. Mike Gleason: Yeah, that's fantastic stuff people do need to keep in mind that the old days of just buying an index fund and sitting back and watching it to go higher, probably coming to an end and Michael would be a fantastic person to look at to switch some of those funds and he's got a great handle on the markets as you just heard. Well, thanks again, I appreciate the time, hope you have a great weekend and I look forward to catching up with you again soon. Take care of my friend. Michael Pento: Thank you so much, Michael. Mike Gleason: Well, that will do it for this week. Thanks again to Michael Pento of Pento Portfolio Strategies, for more info please visit PentoPort.com. You can sign up for the email list, listen to his midweek podcasts and get his fantastic market commentaries on a regular basis. Again, just go to PentoPort.com. And check back here next Friday for our next weekly Market Wrap Podcast. Until then, this has been Mike Gleason with Money Metals Exchange, thanks for listening and have a great weekend everybody.